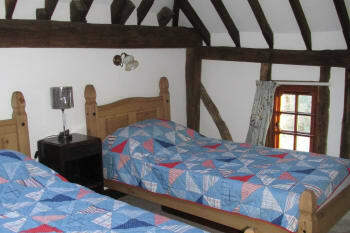 Acorns Barn is a recently refurbished self catering holiday cottage. 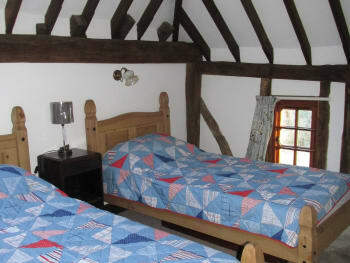 The original barn was built in 1750 and retains many of its beautiful original features. 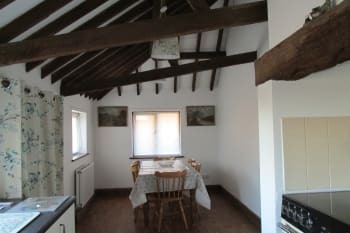 A tranquil rural retreat that can accommodate one to six people with three lovely bedrooms, two bathrooms, large, newly, fitted kitchen / diner. 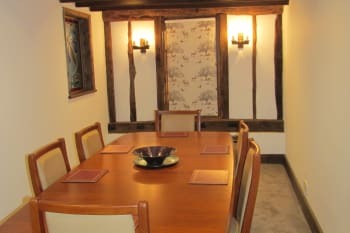 A separate dining room /additional bedroom plus a spacious living room with wonderful period features. Private parking and garden, with large patio and fish pond (children welcome but must be supervised). 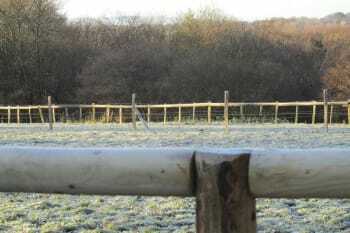 There are extensive views over the adjoining paddocks and woodland. There are no rooms available at Acorns Barn for these dates. Such a beautiful property! Wish we had stayed in the summer to be able to enjoy more the outdoor space. Owners are very welcoming. 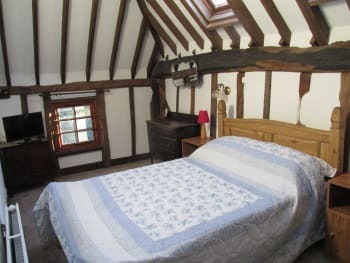 Will consider staying again there for a future trip in Sussex. Good base to explore Sussex. If you have kids: Knockhatch Adventure Park was a lot of fun. This is our second stay in this wonderful property. It really is the perfect place to relax or explore and with every home comfort that you would need. The outdoor area was particularly good this time with the nice warm weather that we experienced. John and Karen run the barn so well and the little personal touches are the icing on the cake. Highly recommended. Lots to see and do in the area and maps and guides readily available. Thank you so much for this fantastic review. We are really pleased you enjoyed your stay and we look forward to seeing you again in the future. Lovely house, has everything you need and very comfortable. The barn was amazing!! 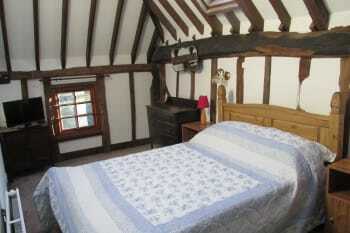 Lots of room and very homely ,, everything you would want when you are away from home !! Only stayed for two nights but could of stayed for a week !! Thank you for your excellent review. We are so pleased you enjoyed your stay. Hopefully you can make it a week next time!! We had a fantastic stay at this barn, our family of four and 2 family friends. The barn is beautiful and very well converted. John showed us around on arrival and told us to contact him at any time - He and his family live on the farm next door. We did contact him, but not concerning and short-fall or complaints. We were leaving on the Friday and asked if we could leave a little later than the 10.30 stipulated. John and Karen were more than happy for us to do this and indeed gave us a huge bag of their windfall apples to take home with us. 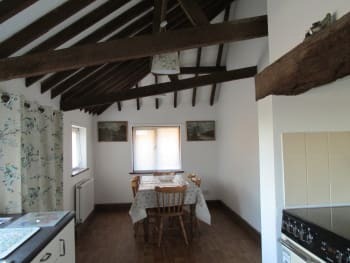 Each room in the barn was beautifully presented and though we ate all of our meals in the spacious kitchen/dining area there is a separate dining room. The utility room houses a washer and tumble dryer. 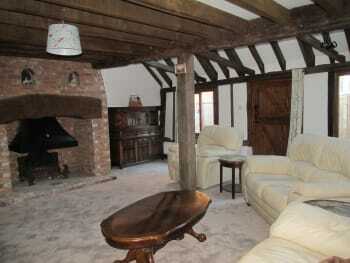 The living room is an large olde worlde space with timbers and a large fire place. We spent evenings there playing board games (lots stored in the cupboard, with books and leaflets regarding local attractions.) 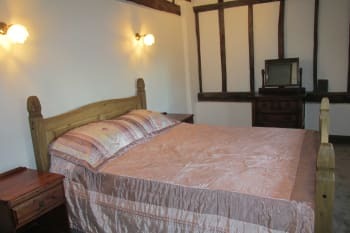 All three bedrooms were well appointed, presented with artistically arranged towels and individual soaps. 2 of the bedrooms and a bathroom are upstairs and the 3rd bedroom and another bathroom are on the ground floor. 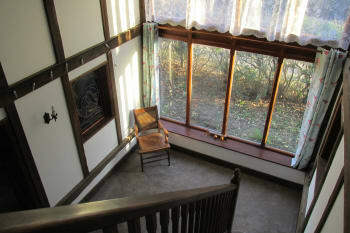 This worked superbly for us and we mentioned to our hosts that they should emphasise in their profile that there is a ground floor bathroom and bedroom as this would be a great bonus to many people - we could easily bring my elderly mother here as she wouldn't need to climb any stairs. After our days out it was lovely to sit outside on the terrace in the autumnal, late afternoon sun with a cup of tea and a slice of cake and watch the horses and goats in the neighbouring field. There was a barbeque containing logs that we could have used, a grassy garden area with small gazebo and pond and a clothes dryer should we have needed it. We would say that we could have parked at least 3 cars if we had needed. 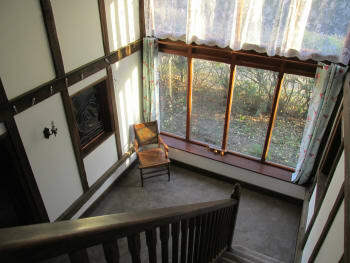 We would highly recommend this property and would love to revisit in the future. Karen and John were excellent hosts and there was nothing that we needed that wasn't provided. On our first day in the barn we looked at the information folder provided by our hosts and decided to walk the mile up the country road to Cross in Hand and the bakery. It was a country mile uphill but a lovely walk through the very attractive neighbourhood. As well as the popular bakery there is a large petrol station at the junction with a Spar shop where we got a newspaper and a couple of other supplies that we'd left at home. On the way back downhill we saw a narrow kissing gate in the hedge and a sign saying No Fishing. Our curiosity roused we went through and found the most amazing and beautiful wood maintained for the local community. There was a small lake, some almost Hansel and Gretelish bridges and paths through the dappled trees back to vthe church or along to Back Lane where the barn is situated. We had a magical walk to the edge of the wood and then followed a right-of-way over 2 small fields to the style which led us back to the lane. In the evening we went to the nearest town, Heathfield, for an Indian meal. There was the choice of 2 restaurants and 1 takeaway. We went to The Curry Inn and had a delicious meal. By the mail A roads Heathfield shows as being 4.1 miles away but using the back country roads reduces this to 2. We visited Lewes and the castle which was very interesting, pretty and in the centre of town. Brilliant views. Then to Ann of Cleves House. This is relatively small but very interesting, there's a tea room a lovely public gardens nearby. Another day we visited Brighton and the Pavilion and walked the Lanes. We finished off our trip with a visit up the BA i360. Fantastic views and by chance both our sons got a free ride as there was a half-term offer for a couple of days. We used the takeaway menus left in the barn to choose a meal one evening. We ordered Dominos pizzas online (rather sceptical about how long it would take for them to arrive and whether the delivery person would find the barn in the dak) and 30 minutes later they arrived, hot fresh and delicious! On our final day - the only day with any grey sky or showers, we went to Batemans the home of Rudyard Kipling and his family. It was very interesting (a National Trust property) with lots of pictures and information. The gardens are pretty and there is a tea room with outside seating if you fancy. Also a walk to a local mill. Acorns Barn is perfectly situated for so many places of interest - we didn't make Sheffield Gardens. Definitely to be recommended. Perfect getaway, beautiful place which is well equipped with everything you need. Peaceful and away from it all but not far away from anything you might need. Friendly helpful hosts and will definitely be back soon. Lots of restaurants and takeaways within a few miles. Fantastic fish and chips from the Trawlerman and an excellent Chinese fro the Superstar which we had delivered. There are many lovely places to see and things to do in Sussex and there is a handy map available showing lots of these. Many thanks for your great review. We look forward to welcoming you back soon. We stayed 3 nights while visiting family in Mayfield , we found the cottage very clean, spacious lovely gardens and views, nice to see horses and goats in the field. Owner very helpful and polite. Thank you for your fantastic review. We really appreciate it and we are delighted that you enjoyed your stay with us. 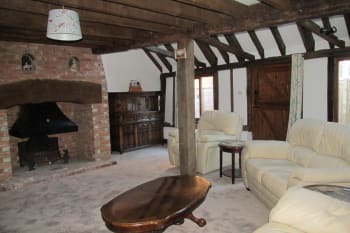 Delightful converted barn with plenty of character. The owners are very friendly and wishing to please. Check out Raystede animal rescue centre if you like animals. Its a charity so you pay what you think to enter. A wonderful holiday property - lovely location, beautifully presented, spotlessly clean, well equipped, spacious and very comfortable. The best property we have stayed in, in the area, to date. Excellent food to be found nearby at The Star Inn at Waldron and The Blackboys Inn at Blackboys. Thank you so much for the great review. We are so pleased you enjoyed your stay and look forward to seeing you again in the future. What a fabulous place to stay! Three bedrooms, 2 bathrooms, spacious living room, dining room and kitchen. Everything you could ever need for a wonderful stay. 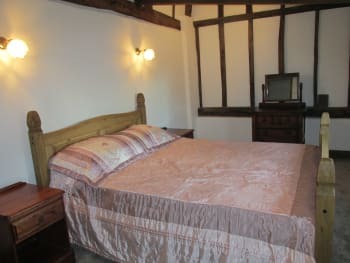 Gorgeous setting, immaculate accommodations, peaceful and cosy. John, the owner, was easy to contact and very helpful. Hope to be back again!